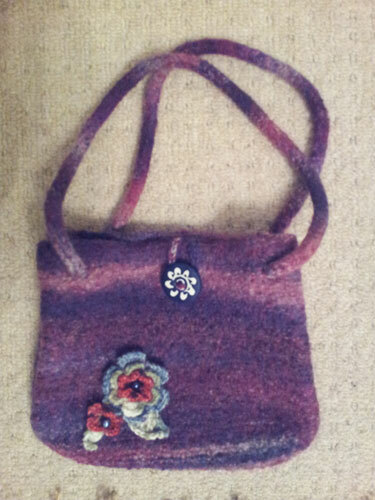 Last Christmas I was given a felted bag knitting kit. It took me a while to get around to starting it and then it took a while longer to knit (but I was determined to finish it before the following Christmas!). I hadn’t felted any knitting before, so the process was unfamiliar to me. The bag was knitted on circular needles and was quite large and flimsy when finished. I then knitted one long skinny handle (only 4sts wide). The next step was to felt the bag and handle. To do this I put them in the washing machine with a little washing powder and a large towel (which apparently helps with the felting process) and put them on a hot wash. When I took them out I was surprised how much smaller the bag had become and how much thicker the pieces were. The next step was to attach the handle and I also added a small button fasten to the top using a simple crochet chain. I wanted to add a little finishing touch to the bag and thought of making some crochet flowers. I came across a crochet flower tutorial on Mollie Makes and set to work with some oddments of wool I had lying around; sewing a bead to make the centre of the flowers. I'm Jo Bund, a designer, artist and maker. With a background in textiles and graphics my creativity is inspired by texture and pattern found in nature and in urban surroundings. My hobbies includes creative sketchbooks, mosaics, textile art, furniture restoration, crochet, printmaking and photography.